"While litigation has played a major role in keeping these fish from disappearing altogether, we very much agree with Governor Kitzhaber that it's time to sit down and solve this problem." "We believe leaders in the region are ready and willing to support a broader discussion of steps that can be taken to manage our hydro system in ways that benefit salmon, power and transportation interests, and that could avoid another round of costly litigation and uncertainty. But we need the BPA, the Corps and the Bureau of Reclamation to step up to the table as well." Governor Kitzhaber is well-known for finding solutions to difficult issues through stakeholder processes. His call for a solutions table places the burden squarely on the federal agencies to take up his challenge. The leaders of a number of national organizations that share a deep commitment to salmon restoration in the Columbia/Snake Basin welcomed the Governor's leadership. "We've been asking the federal agencies to take the very same steps the Governor has called for since a federal court rejected the government's latest plan for Snake and Columbia River salmon restoration last year," said Trip Van Noppen, President of Earthjustice, which has represented fishing, clean energy, and conservation groups in nearly two decades of successful court battles to protect salmon decimated by federal dams on these rivers. "While litigation has played a major role in keeping these fish from disappearing altogether, we very much agree with Governor Kitzhaber that it's time to sit down and solve this problem. We owe it to ourselves and to our children to seize this chance to forge a lasting solution to Columbia/Snake salmon restoration and are grateful for his leadership on this effort." "Salmon are the lifeblood of Native American Tribes in the Columbia Basin," said John Echohawk, Executive Director of the Native American Rights Fund. "No one is more committed to salmon restoration -- or has more at stake -- than the Tribes, including the Nez Perce Tribe whose homeland is above the four lower Snake River dams. We have long believed that those who care about the future of salmon in our region need to sit down and work together with other interests to develop a comprehensive solution for the Northwest: one that addresses fish, power, transportation, economic, and cultural needs. Governor Kitzhaber's call for a solution, and his proven leadership on these inter-related salmon and energy issues, will help chart a new course towards a future with broader benefits for the entire Northwest." "We have a chance -- and a responsibility -- to not only protect and recover salmon, but to save and create tens of thousands of family-wage jobs that depend on healthy salmon populations, clean energy, and sustainable transportation" said Jim Lyon of the National Wildlife Federation. "We can't afford not to answer the Governor's call to pull together those with the most at stake to accomplish that." "Federal courts have played an essential role in securing stop-gap measures to protect endangered salmon, said Bob Irvin, President of American Rivers. "Conservationists, fishermen, and clean energy advocates are gratified to have played a role in securing stop-gap measures to protect salmon over the past two decades. But we agree with the Governor that the solutions to move us all forward can be found outside the courtroom and now is the time to do that, while the government is developing a new salmon plan to replace the one the court rejected. It will take work and involves risk, but we are committed to see this through." 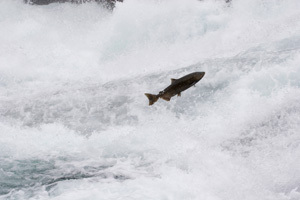 "The Sierra Club is pleased to support Governor Kitzhaber's call for dialogue and a solution to the Columbia/Snake River salmon crisis," said Debbie Sease of Sierra Club. "It's now time for other regional leaders from across the Northwest to join with Governor Kitzhaber and lend their authority to this critical effort." "NRDC is proud of the Northwest's record of clean energy and energy efficiency leadership, which we have helped create with BPA and many other regional partners over more than three decades," said Bobby McEnaney of the Natural Resources Defense Council. "Now is the right time to have a more formal discussion regarding how the BPA, the U.S. Army Corps, the Bureau of Reclamation and others can be more effective in ensuring that federal hydropower will serve this clean energy vision while restoring the iconic salmon runs of the Columbia and Snake River basins."